When working at a smaller scale (ie. 1/8th"), make it so the duct center lines always appear the same size. The duct center lines are drafting tools only and do not appear on the drawing therefore having them adjust with the DIMSCALE is not neccesary. When the DIMSCALE is changed to 96 or higher, drafting in tight spaces can be difficult when the duct centerlines are large because the arrows are too large to work with and tend to overlap others. 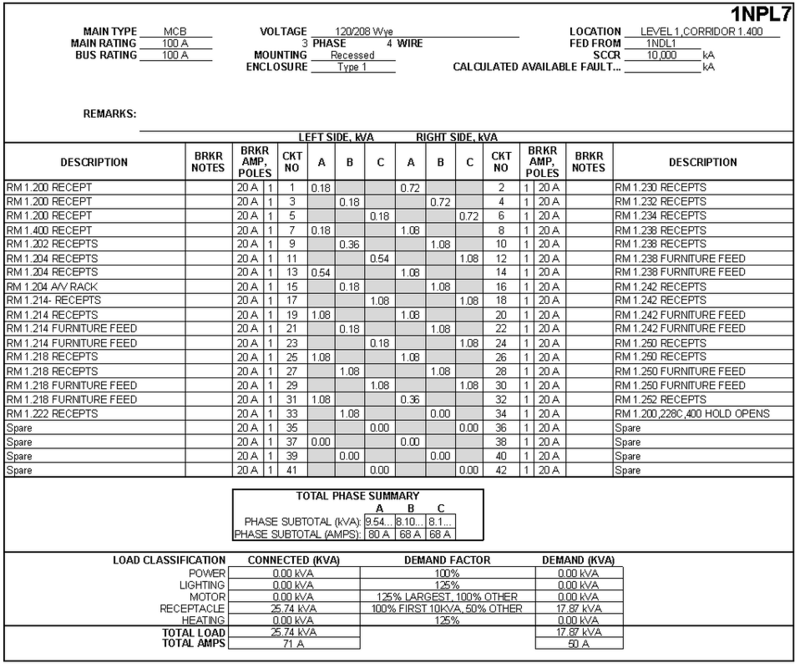 It would be a huge time saver to be able to Export a project electrical equipment schedule into excel for quick data entry and then import back into DM/Autocad. Entering a large list of kitchen equipment can be tedious. Being able to do this in excel would be quicker. The import/export functionality could be similar to how DM handles the layers for the standards database. Alternatively, listing the equipment as a table with aligned rows/columns would be equally efficient. Be able to specify a custom description for the voltage on light fixtures when they are set to "Universal". Currently DM lists all the voltages that are used on the fixture. This feature would allow you to override that and specify custom text for the voltage in order to better match the manufacturer's cut sheet. Labeling diffuser cal louts with (TYP 2) if they are in the same room or near each other. When the same diffusers are located in the same room, it would be nice if there was an option to label one diffuser and then (TYP and then the quantity it applies to) as opposed to labeling each individual grille/diffuser. This would help clean up the drawings quite a bit from unneeded notations. In the diffuser tag, add a spot to list the diffuser neck size (so the duct runout doesn't need to be labeled and will clean the drawings up). It would be nice if one diffuser tag can be used for various diffuser neck sizes, for instance, a CD-1 is more of a description of the diffuser type and model and a pull down with diffuser neck size would be input, then the schedule can list CD-1 with a line for quantity of each diffuser size. This would make creating a master schedule much simpler. Be able to customize the "N" and "G" label in feeder callouts to different text. Likely you would change it to "NEUTRAL" and "GROUND", but give you the option to choose whatever you would like. Select multiple devices and delete all custom notes (not fixture callouts) attached to them. The "Match Device Label Locations" command can add many callouts at once, but there does not seem to be a way to easily delete multiple callouts. This would be especially useful when adding lights to a circuit that already contains lights. Running “Draw Homerun And Loops" would erase a lot of my work, so I usually delete all the circuit callouts manually before drawing loops manually. If this feature already exists, please make it easier to find. Would be very helpful to be able to be able to have multiple sources connect to the same bus. We have had numerous situations where we have had Geneva type switches, multiple kirk-key input as well as paralleling switchgear situations where we were unable to find a "work-around" using this software. This is becoming especially common with ConEdison now permitting the paralleling of electrical sources. I would like the ability to break out individual fault current schedule entries into separate groups based on the service connection or other arbitrary criteria. For example, in a project with three electrical services, the distribution equipment fault current associated with one service could be scheduled separately from the other two services. Design Master currently schedules all fault current schedule entries together. On projects with multiple services and dozens of distribution equipment entries, a method of showing specific fault current calculations in separate schedules would be invaluable. Convert existing ductwork and piping layer to demolition.